Today, when you order "MAGIC Magazine: June 2014 ISSUE", you'll instantly be emailed a Penguin Magic gift certificate. You can spend it on anything you like at Penguin, just like cash. Just complete your order as normal, and within seconds you'll get an email with your gift certificate. A passionate close-up magician who assembles bridges over the gap between fantasy and reality, Garrett Thomas thinks not only about what those connecting spans accomplish, but how to build them from both sides of the chasm. The two decades around the turn of the 21st century were a golden age for magic taught on videotapes and DVDs. L&L Publishing became one of the leaders in the field, making stars of the magicians and their enthusiastic audience. Jeff's name, pronounced "War-zak," might be difficult to spell and largely unknown in much of the magic world, but he is a consistent worker with a long, successful career, and a clever series of cards that promote himself and magic. William Shakespeare's final play, The Tempest, is filled with magic, and yet it has never been staged to take advantage of the theatrical conjuror's craft — until now, with a new production conceived and co-directed by Teller. I was fifteen years old, and Brother John Hamman was my first and only model. As I began performing his work for laypeople, I noticed a number of consistent behaviors. My audiences would forget obvious conditions; they would respond to effects that I hadn't planned; and from these observations, they became more than mere viewers or mere reactors. They became also my unknowing collaborators. When we think about the relationship of method and effect, we usually think that method is the performer's side of the net, and the effect is the audience's side. But the idea that the audience can unknowingly play both sides of the net is a unique one. 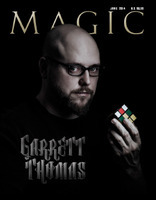 A close-up magician based in Western New York, Garrett Thomas is known for his manipulations and innovations. Here, the subject of the feature story on our cover this month explains some of his best known moves, subtleties, and effects. This month's guest contributor is Pablo Amira from Chile. Pablo has come up with a neat pendulum routine with a couple of unusual features. The first is that it is intended for stage use, as opposed to close-up performance situations. The second is that everyone in the audience gets to not just participate, but to experience a small taste of what it must be like to have strange mental abilities. What's more, the routine is entirely impromptu and very versatile — it can feature numbers, pictures, company products, or anything you want. Quiet in the Library? Not at My Show! My house now is full of books and not nearly enough bookcases, but I still really feel at home in libraries and I love performing in them. Why work libraries? Summer reading programs have really grown over the years and are a big percentage of the shows I book. I personally find it very rewarding to get kids excited about reading and understanding the resources they have available to pursue their interests. On the business side, I'm performing not just for kids but for their parents. Library parents tend to be very involved in their kids' schools, so performing at libraries leads to lots of other bookings. On the creative side, I get to write, build, and create a brand-new show every year and, in doing so, I generate routines that work their way into my regular show. I'd like to share some advice about putting on a great library show. To understand the significance of this letter, it is important to fully understand David Devant's status in the magic world during the early years of the 20th century, his close association with the Magic Circle in London, and the falling out that occurred between them. At a meeting of the Magic Circle on April 5, 1910, the unthinkable happened. Secretary Henry Donn stood before the council and read David Devant's letter of resignation. "Magic and Christmas" resonates in the ear of a marketeer. With fewer than 250 days until Christmas, it's time to get ready for that most lucrative time of year, and magicians all over the country may be able to share resources and ideas for cashing in on "The Drosselmeyer Connection." It's time for us to get our fair share of the fruitcake. Moments before sawing up one of my bookshelves for the sake of a magic trick, I paused to consider whether I'd actually gone insane. I was about to saw up the shelf because I needed a piece of wood. I needed a piece of wood because I was trying to make a specially gaffed display stand for a playing card. I needed the stand for a routine that I was developing. I was developing the routine because I needed something with which to represent Australia at the upcoming 2012 FISM World Magic Championships and was otherwise completely out of ideas.